Lorene Scafaria makes films about apocalypses. Her directorial debut, “Seeking a Friend for the End of the World” focused on a global-scale crisis that threatened the entire human race (including stars Keira Knightley and Steve Carell, who are both looking for those titular friends for said world-ending), but her newest feature takes things on a much more intimate level. Starring Susan Sarandon and Rose Byrne as a mother and daughter dealing with the death in very different ways, Scafaria’s “The Meddler” is a very sweet (and very sensitive) look at mourning, mothers and moving on. 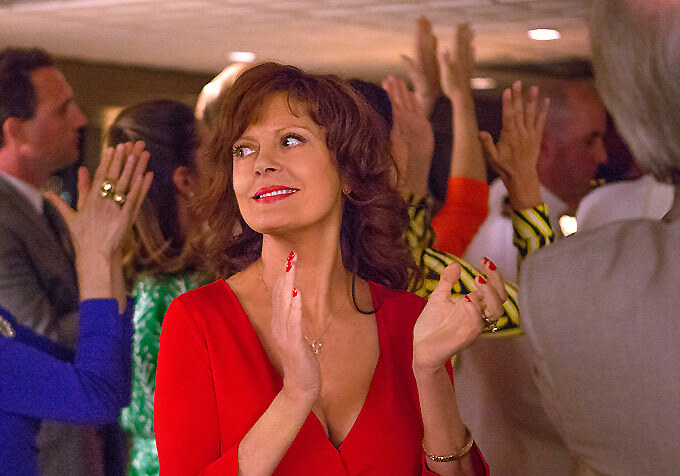 Based on Scafaria’s own experiences dealing with the death of her father, “The Meddler” stars Byrne as Lori, a depressed TV writer who can’t quite get a grasp on, well, anything since her dad passed away, while Sarandon stars as her plucky (and, yes, meddling) mother who moves closer to her daughter in an attempt to get them both healed up from some big time pain. Along the way, Sarandon’s Marnie totally revitalizes her own life (and maybe even Lori’s), thanks to her spirit, her charm and handsome guy named Zipper (played, of course, by J.K. Simmons). Indiewire sat down with Scafaria at the Tribeca Film Festival to talk about the personal tragedy that inspired her film, what she learned on her first film and why she had to fight to make “The Meddler” what she wanted it to be. One of the best things about the film is that, while Marnie is a meddler, it’s very much warranted when it comes to Lori. What was the genesis of that idea, which really flips a known movie trope on its head? I like the idea of telling a story about the daughter character being on the wrong side of 35 and still acting like she’s 16 around her mother. They see us at our worst because we can be our worst selves around the people that have to love us unconditionally [laughs]. The story came from my own meddling, sweetheart mom who moved from New Jersey to Los Angeles to be closer to me after my dad died and the two of us were grieving in very different ways. She was doing it beautifully and very optimistically and I was not. I certainly felt like I didn’t need a meddler in my life at that time. I wanted to be left alone and left to my own misery. Personally for me, after my dad died, being loved that much was hard. It’s so complicated when you go through something like this with somebody and you go about it in different ways. My mom just went to the pharmacy for me and picked something up. She used to bail me out of trouble when I was in school [laughs]. I would forget my homework and I would call her and ask her to bring it in and she’d say, “Ugh, I should be teaching you a lesson. But what would I do for a friend if a friend called me? I’d bail them out,” so we’ve always had that friendship first, which can just make a relationship really hard. Has she been involved while you’ve been promoting the film? We were in Toronto at the movie premiere and I was doing press and I came down the hallway to run from one thing to the next, and she was standing there with an umbrella because it was raining. And I was like, “Mommmm, someone would have gotten me one, probably. Or I could have gotten wet!” But there she was, with an umbrella. That’s why I wanted to not make a negative movie about a meddler. Obviously, this is a very personal story for you. Did you find that writing the script was really cathartic or did it dredge up things? It was really cathartic. Writing the script was cathartic and I certainly wasn’t sure how personal I was going to get with it when I was writing it. I was excited about her character and what she was going through and her move to LA and being a fish out of water and all her quirky little things. But I really wasn’t sure how personal I was going to get. The more I wrote it, the more personal it got. It was cathartic to share it with her at the time. I think she was realizing things about herself and I was realizing things about myself. And I certainly meant for it to be kind of an apology, among other things [laughs]. Now that we’re putting it out…now it’s all personal again. We’re going to watch it tomorrow with my uncles and my ex-boyfriends and who knows who’s going to show up to this screening. But just like everything else, we’re even experiencing this differently. Again, for me it’s work and for my mom, she’s just having the time of her life, which is all I want. Casting this film must have been of particular import for you. How did you go about snagging Susan and Rose? I felt that with the two of them and J.K. [Simmons], I thought, “Oh, my God, I’m actually not set to fail. This is unreal,” because of course casting is 90% of it. Nobody wanted to make it [laughs], it took a long time, I wanted Susan for it so bad, but I didn’t know her or didn’t think we could get her and nobody was really helping push the rock up the hill. One night I was kind of fed up and there were “Tammy” trailers playing and I was like, “Damn it, I’m just going to send it. I don’t care.” So I wrote a letter and I sent it to her agent, cold and unsolicited. She thankfully read it and liked it and gave it to Susan, who liked it and within a week we had met. It was wild. As you know, she’s the most beautiful person on the planet. But also just so maternal, warm and cool and a great humanitarian. It’s kind of like Marnie Supreme is what Susan is. I think she took to the character a lot. What was some of the feedback that you were getting from people not wanting to make the movie? “Can they be younger? Can the daughter be in her twenties? Can the mother be in her fifties? Can the daughter role be as big as the mom role? Can it focus almost be more on the daughter?” Which went against everything that I wanted to do, but it would have defeated the whole point of the movie in a way [laughs]. Then it was, “Can it be on television?” because female characters are allowed to flourish on TV. Those responses made me that much more determined to make it this exact film. I wanted to focus Marnie’s story, Susan’s story — certainly with Rose’s incredible performance. I wanted it to be a story about this woman and what it is she goes through. She’s over 60 and it’s a film. We’ve been seeing more of those films lately, from “I’ll See You in My Dreams” to “Grandma.” Do you think that tide is turning? Yeah, I think we’re getting there. We might not be a genre anymore — “women’s movies” — but seeing those films, people kept saying, “Did that make anything easier?” We shot this a year ago so we were looking for money well before that. So no [laughs]. They didn’t make it any easier. It’s so great to see now. It was so exciting to see all these films, “Grandma,” “Hello, My Name is Doris,” all these movies that are now rolling about women and again allowing women be people, allowing us to be a part of the human condition. Isn’t that nice [laughs]? Your first film, “Seeking a Friend for the End of the World,” was also very much about the human condition. Did you learn things making the film that helped you craft this one? Yeah, everything. Since that was my first film, you don’t know what to fight for. And the answer is everything. So when it came to this, I wasn’t as desperate to get it made, so I didn’t want to make it the wrong way. Certainly once the cast came on board, it got a lot easier to find money, though certainly not a lot of it. I learned a lot, certainly what not to compromise on and what to fight for. But I had such a great experience on that, too. I really did have fun with those actors. It’s a flawed movie for me, it’s hard. I haven’t really watched it a lot, but I’m still really proud of what it says and its content and the cast and certainly the ending. I appreciate it if it still gets people. “The Meddler” is in theaters today. Stay on top of the latest festival news! Sign up for our Festivals newsletter here.